Last fall, the direct-action marine preservation group Sea Shepherd launched Operation Milagro II (Operation Miracle) with the stated purpose of saving "the most endangered marine mammal in the world—the vaquita marina porpoise." By this month, the operation had removed 42 gillnets—indiscriminate killers that are decimating the vaquita population—from the upper reaches of the Gulf of California. These fine-mesh nets are already illegal, thanks to a move by Mexican president Enrique Peña Nieto to ban them in the Gulf for a two year period (there is currently a push by conservationists to make the ban permanent). In addition, the Mexican government has begun compensation payments to impoverished local fishermen whose livelihoods are being impacted. Unfortunately, despite all these efforts the world's smallest porpoise looks like it may still vanish into extinction. And so on Friday, May 20, Endangered Species Day, the plight of the vaquita is more dire than ever. According to a recent report, there are only 60 vaquitas left in the world and their numbers are dwindling rapidly. In 2014, it was estimated that around 100 remained; a 40% decrease in only two years. In March alone, three dead vaquitas were pulled from gillnets. Unless something is done immediately, the vaquita will likely be extinct within 5 years. 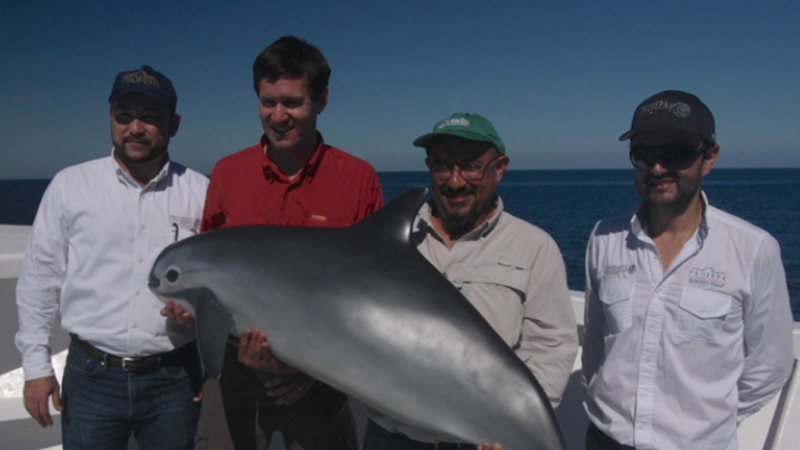 Every fall, prior to the start of fishing season, scientists use an acoustic survey in the Gulf of California to track the creature's echolocation. And the waters are growing shockingly quiet. Bizarrely, the vaquita isn't being hunted to extinction on purpose. They're just collateral damage in the insatiable demand the Chinese have for another rare marine animal. Chinese consumers prize the swim bladders for a large fish called the totoaba which is itself going extinct. The gillnets used to catch this endangered fish—like the vaquita seen nowhere else but the Gulf of California—is extremely effective as a technique, but does not distinguish between species. In 2013, authorities seized 200 totoaba swim bladders destined for China that would have been worth an estimated $3.6 million. With that kind of money at stake—approximately $18,000 per bladder—how could a poor fisherman pass it up? Nonetheless, the vaquita can still be saved, but it will take an even bigger commitment on the part of the Mexican government. A report released last week by the International Union for Conservation of Nature was unequivocal in its language. “While there is good reason to expect that vaquitas could recover if deaths in gillnets were stopped, if gillnetting is allowed to resume in the northern Gulf, the vaquita may be extinct by 2022," said Barbara Taylor, co-chief scientist of the survey and a member of the recovery team." Of course, the vaquita and totoaba aren't Mexico's only endangered species. In fact, the nation has the highest number of endangered species at 101. Mexico is extremely biodiverse and many species have very specified habitats. In addition, agriculture, logging, and land development for residential/commercial use are leading factors for these declines. Let's be clear: we're not playing favorites with the vaquita simply because it looks cute. Species are going extinct on a regular basis and many experts believe we're in the 6th major extinction event in world history. But the vast majority of animals don't get our attention simply because they aren't sharable in a Facebook feed. The plight of the totoaba is just as grave and should have just as many resources dedicated to save it. But there is one distinction setting the two animals apart: while we know the totoaba is critically endangered, we don't know exactly how many there are left. At 60 vaquitas remaining, the stakes could not be more clear. If we don't do something now, this animal will vanish in the blink of an eye.